Hi Lucy...This is just beautiful! Lovely for banishing the winter blues and thinking of spring! what a fabulous card. Sounds like you've had a good weekend :) .. that film is certainly on my to do list LOL. Love seeing that background again, and your little white dots add a nice dimension! Thanks for the thumbs up on the movie, too - it's on our list of things to do! Fun card! Love the gems! Lovely card Lucy. Thanks for the inspiration using the BG stamp. How sweet! I love the colour combination that you used! Great work! Lucy, I love what you did with the Flower Wallpaper! Such a bright and happy card! Lovely card. I like the white dots on the background a lot. What a beautifull cards you make! It really inspires me! Seriously sweet card, Lucy....love your detailed stitching, it adds so much to your lovely design! I just saw The King's Speech last night..i recommend it highly also, wonderful story. I lve it and the colors too ! 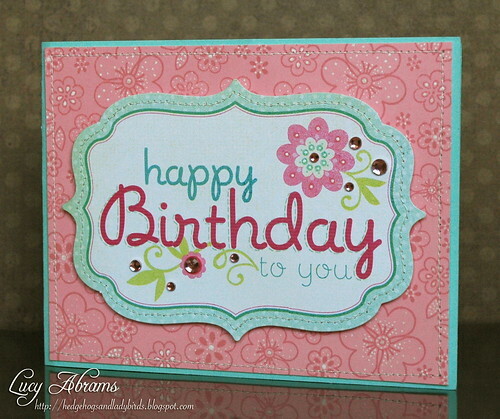 Hi Lucy, I love this card, so pretty! Glad to hear you liked The King's Speech; that's next on my list; we saw The Black Swan this weekend; also very good! Thanks, Lucy. I was trying to come up with a birthday card today and wasn't happy with the direction I was going in. You card inspired me back on the track I wanted to be on. As always, love your work. Love the die cut - what a great idea...gonna go get some! !